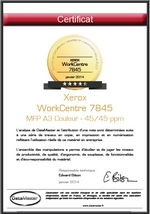 DataMaster has published the evaluation certificates for the Xerox WorkCentre 7845 and WorkCentre 7855 A3 color MFPs. DataMaster publishes evaluation certificates after machines are tested in our independent laboratory. More than 40 tests are carried out to evaluate the machine's functions, flexibility, quality, productivity, usability and environmental aspects. The WorkCentre 7845 and 7855 both achieved very good results and were awarded 4.5 stars out of a possible 5. Download the Certificates and Rosettes for these machines by clicking here.